Chris Warburton was called in as a last minute substitute for Nicky and presented this morning’s show alongside Rachel Burden. Rachel told listeners she had been in touch with Nicky and he was recovering well. Nothing to add but… Get well soon Nicky! 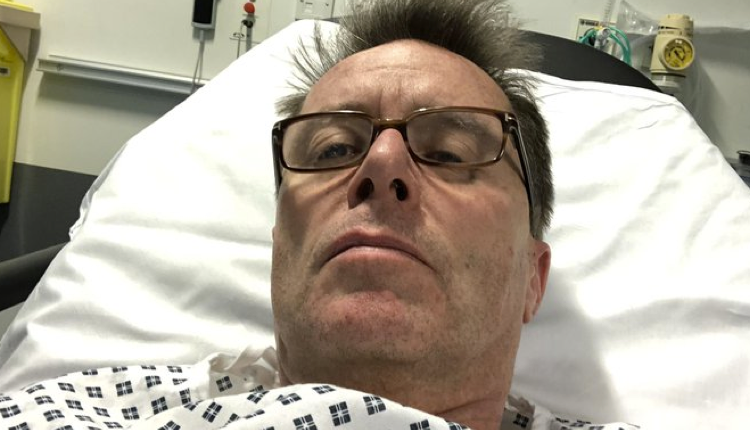 Best wishes to top broadcaster Nicky Campbell, for a very speedy recovery. Get well soon Nicky ! Do we really need the picture? Thank goodness he is still well enough to tweet. Get well soon Nicky Campbell! One of my pals is prone to kidney stone problems! He told me, “the most painful part of the disorder is passing the stone!” The bouts left my pal shattered for days! Could you please let me know what is happening to Hear Radio? Is it going off air or continuing to broadcast on another platform?